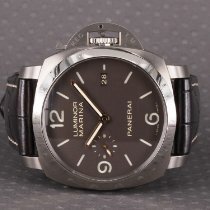 This stunning Panerai Luminor Marina 1950 3 Days Automatic model is Titanium and in great condition! This excellent watch has a unique "Tabacco" brown dial with luminous Stick and Arabic hour markers. The watch also has a Seconds subdial at 9 o'clock and a small Date Window at 3 o'clock. All hands are Gold-Toned luminous and Titanium. The watch has a 44mm case and is on a Brown Nubuck Alligator strap that measures approximately 7"-9". Comes with box, booklet, and pusher and watch is O series.